Losing a loved one unexpectedly can be a devastating experience. And when your loved one has died because of another person’s negligence or recklessness, you may wonder whether you have any way to seek justice. Two options for getting justice include filing a wrongful death claim or filing a survival action against the negligent party, but not everyone qualifies to bring one of these lawsuits. 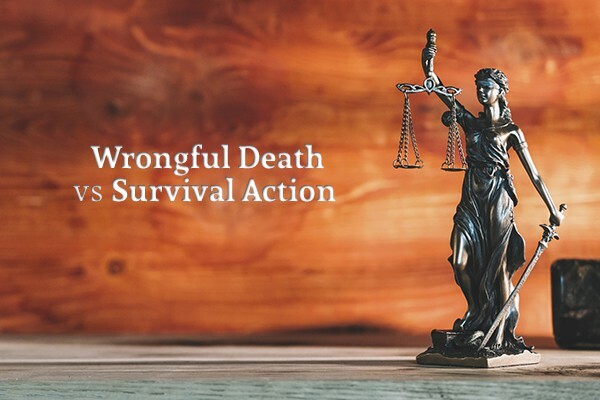 Read on to learn more about wrongful death claims, survival actions, and what you’ll need to do to prove your right to recover damages under Texas law. Each state sets out its own laws specifying who has the right to assert a wrongful death claim. Even when a defendant’s negligence is clear-cut, if there is no one who has standing, or if those who have standing don’t file a lawsuit within the prescribed statute of limitations, the lawsuit can’t proceed. In Texas, the individuals who have standing to pursue a wrongful death claim include the surviving spouse, children (including adult children), and parents. While money can never bring your loved one back, it can help compensate you for the physical, financial, and emotional losses you’ve experienced. If you’re able to prove that your loved one’s life was cut short as a direct result of the defendant’s negligent or reckless behavior, you may be entitled to recover compensation. In a wrongful death claim, you and other dependents may recover “loss of support” damages, which are damages that directly stem from the loss of financial support your loved one provided. Wrongful death claims can also generate a cause of action for “loss of consortium” damages on behalf of the surviving spouse. This term is sometimes understood to refer only to the loss of a sexual relationship due to the decedent’s death, but is usually interpreted more generally as the loss of love and spousal companionship. Children are also able to recover damages for loss of love, support, and guidance. Depending on the circumstances of the death and the degree of alleged negligence on the defendant’s part, a wrongful death claimant may pursue punitive damages. Unlike the other types of damages available, which are collectively referred to as “compensatory” damages, punitive damages are meant only to punish the wrongdoer and discourage others from engaging in similarly negligent behavior. Compensatory damages are based on the actual costs incurred by the surviving family members, but punitive damages don’t need to be tied to any specific dollar figure. A survival claim is similar to a wrongful death claim in that it may be brought by a surviving family member on a decedent’s behalf. However, unlike a wrongful death claim, a survival claim can also be brought by the personal representative of a decedent’s estate. A surviving relative can opt to bring both a survival claim and a wrongful death claim, depending on the circumstances; a non-relative personal representative is limited to a survival claim. A survival claim focuses less on the harm caused to the decedent’s surviving family members and more on the harm caused to the decedent. This type of claim can generally be brought in any situation where the decedent, had he or she survived, would have a viable claim against the named defendant for personal injuries. If you’ve recently suffered a terrible loss and aren’t sure where to turn, the personal injury attorneys at Juan Hernandez Law can help. You only get one shot at a lawsuit, so get someone by your side who can ensure that you get the compensation you deserve. Juan Hernandez is board certified in Personal Injury Law – a certification that only a very small percentage of personal injury attorneys have received. Call (214) 712-3823 or visit their website to schedule your free consultation.